Nostalgia isn't for every one. My wife, Cathy, isn't very nostalgic. She doesn't like to dwell too much on the past. Dwelling and obsessing on the past is not a very healthy thing. But there are some things about the past that were pretty cool, and worth reliving. Like the live action Batman television series that ran on ABC from 1966 to 1968. Last July, DC Comics launched Batman '66 as a webcomic. Stories would appear as a webcomic through DC and Comixology. (It was just announced last week that Amazon would purchase Comixology.) The webcomics would be available for a mere $ .99. The stories would later be collected in print, and each issue would be available for $4.99. Now, the downside to webcomics, is the same downside to iTunes. The buyer doesn't actually own a physical copy of either the song, the album or the comic book. For ninety-nine cents you are actually buying access to either listen to the song or album; or read the comic book. There is currently a debate going on over what happens to a buyer's iTunes playlist when that buyer dies. Now this access may appeal to some people. It appeals to me on a level where my space isn't cluttered with long boxes full of printed comics. But at the same time, I enjoy reading a comic book the same way I enjoy reading a hardback or paperback novel. There is something about the feel of paper and the smell of old comic book newsprint that is enjoyable. So, as much as I would love to have a tablet filled with my favorite comic books - as if that were possible! - I have resigned myself that I need a space for my long boxes of comic books. There are a few that are my go-to books to re-read. Starman, by James Robinson, Tony Harris and Wade Von Grawbadger; Ultimate Spider-Man by Brian Michael Bendis and Mark Bagley; and, my Batman collection. Now, you would think that as a Batman fan I would have boxes and boxes of Detective and Batman Comics. Legends of The Dark Knight. The Shadow of the Bat. The Brave and the Bold. The World's Finest. Whatever "mainstream" title Batman has appeared in. I have a few of those. The collection of Batman comics I enjoy the most is the animated series tie-in. After Batman Returns, Fox Kids launched Batman: The Animated Series, in 1992. DC launched The Batman Adventures not long after. They kept the series going through a number of re-launches. When The WB launched The Batman, DC followed with The Batman Strikes. Then came Batman: The Brave and the Bold, both on Cartoon Network and from DC. Batman '66 #6 featuring The Bookworm! The latest gem in my Batman collection is Batman '66 written by Jeff Parker. There are stories written by Tom Peyer with a rotating art crew that involves Jonathan Case, Mike and Laura Allred, Ty Templeton, Craig Rousseau, Chris Sprouse, Reuben Procopio, Christopher Jones, Colleen Coover, Dave Johnson, Sandy Jarrell and Joe Quinones. It is as if the television series had not been cancelled. Along with appearances by The Joker, The Penguin, The Riddler, and Catwoman - all staples of the series - there's the unique guest villains designed for the stars that played them. Egghead, King Tut, Zelda The Great and Olga Queen of the Cossacks. What is brilliant is that Batman '66 and Parker are doing some really creative things with the series; like, [spoiler alert] revealing the link between Jervis Tetch's The Mad Hatter and The Clock King. Batman '66 #8 is a unique time travel story involving King Tut, his goons and The Dynamic Duo all heading back to ancient Egypt. One of his goons is Waylon Jones. I'm sure we'll be seeing him again in another form very soon! The issue that I brought along with on my trip to Kiev to bring home my daughter, Masha, is Batman '66 #6 featuring Roddy McDowell's The Bookworm. I like Roddy McDowell. He was awesome in his only appearance on the series in the role, and later in The Planet of the Apes series. He later returned to Batman, reading the novelization of the first Batman film in 1989; and later, on The Animated Series as The Mad Hatter. 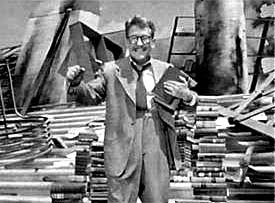 The Bookworm, as described by Batman on the original series, is a frustrated writer. He is the ultimate fanboy. In the Batman '66 appearance, Bookworm is composing a scrapbook on Batman, in an effort to stay one step ahead of the Caped Crusader. Rather than stealing an over-sized check from the Gotham Chamber of Currency, he steals the over-sized checkbook! He also tries to steal a set of 19th Century matchbooks! He does manage to steal the Gotham City Police department manuals, so they are left unable to operate - (wait for it) by the book! Batman '66 is written as a fun comedy, pretty much how the original series was played. The art is spot on. 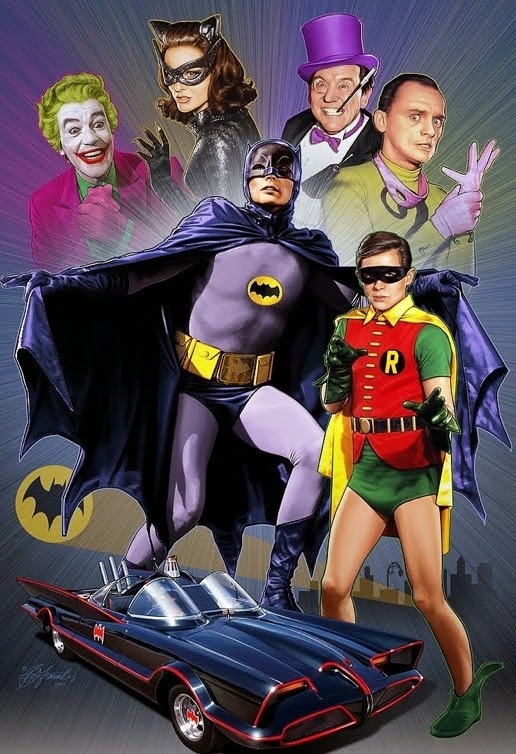 Although the likenesses are only through the feature film, with only Adam West, Burt Ward, Julie Newmar, Ceasar Romero, Frank Gorshin and Burgess Meredith licensing their likenesses. Yvonne Craig recently licensed her likeness for Batman '66 merchandise. It is an enjoyable, fun read. Like the original series there's a gag on every page. Which makes Batman '66 a definite creature comfort from home. But wait! There's more! This summer Batman meets an old associate. Kevin Smith of Clerks fame will be writing a Batman-Green Hornet crossover! 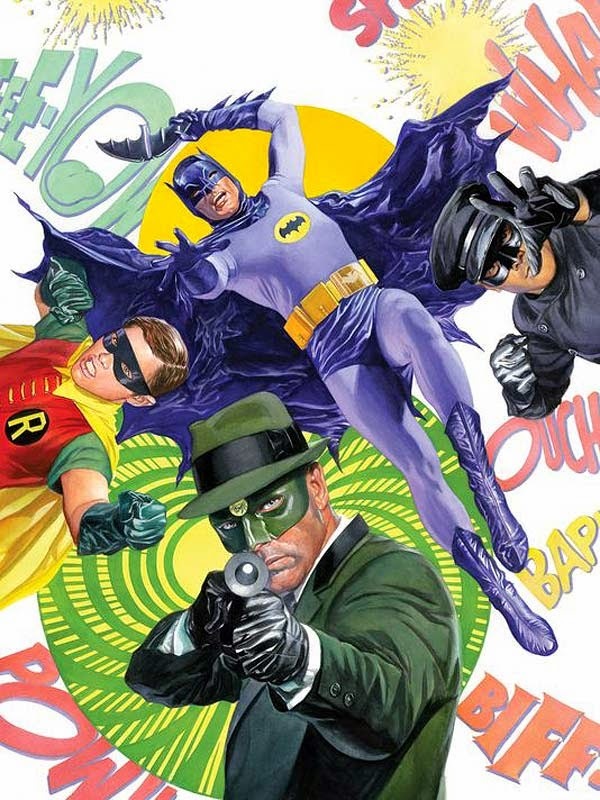 Green Hornet was from the same production company as Batman, but only lasted on television one season.